So what are the “causes’ of top thread tension problems? If you are NEW to sewing/embroidery and have this problem, I’m not picking on you or trying to be mean or condescending!! Please read all of this observation and information with a sincere “been there done that, that’s why I can say this”, tone in my voice! You’re here because you’re having a problem and are looking for a solution. So let’s get started! FIRST, did you read the manual/instructions on how to properly thread the machine? 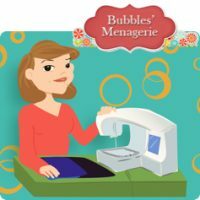 I belong to over 200 Facebook groups on sewing/quilting/crafting and I know exactly how exciting it is to get your machine, take it out of the box and start playing – without going thru the manual step by step. And before you say you hate manuals because they don’t make sense. Don’t even go there. Today’s manuals are excellent sources of information. My first machine manual had to have been written in Greek, translated to Japanese and that was translated to English using a very old version of Google Translate. There were very few pictures and the captions that went with the pictures did not relate. Today’s manuals have more pictures than words and are clear and concise with BASIC information. There is NOTHING creative in the manual. Your manual’s job is to explain the boring mechanical stuff so you can be successful with your creativity. Get out your manual and become familiar with it. But, I digress 🙂 Because I have immersed myself in so many online communities, I see top thread tension problems every day. Most of those are a result of improper threading of the top thread. I think that what happens is that we look at the instructions in the manual quickly because they appear to be so easy -” ok you just pass the thread thru the numbers, put the presser foot down, and use the needle threader. Sounds easy enough.” So we get to the machine and maybe the presser foot is already down, so we say to ourselves, “have to do that anyway, let me just thread the machine and use the needle threader like the instructions said”. Not exactly….that is NOT what the instructions said. The presser foot controls the top tension! If its down, the tension disks are closed tight so your thread does not even go in between the tension disks! So take out the manual and go step by step thru the boring “how to thread your machine instructions”. The other thing that is not helping the new embroider-er is that sewing is not always taught in schools. You can’t take sewing classes at the local girl’s club for 35cents a week. Many have missed out on the “joyful” experience of having to learn how to thread and rethread a sewing machine – step-by-painfully-slow-step. So the whole “threading with purpose” is not a natural exercise. Machines these days are so smooth and automated! Back then, if you didn’t hold onto the top thread so that it had tension on it as you threaded the machine- it wasn’t getting threaded correctly and it was obvious. You’d get to have Mrs. C clip at the spool, so you got to pull the thread thru and do it again…and again. Since there was no such thing as an automatic needle threader back then this was not something that you did willy nilly more than once. So even if the presser foot is up, if you aren’t “threading with purpose” and just lollygaggingly running the thread thru the numbers, you may again be missing the top tension OR you get a loose loop in the top tension so the thread pops out because its not really in the tension disks nice and securely. Ok, so you’ve threaded the machine according to the instructions. How do you know its in the tension disks? After you thread the needle with the presser foot down, lift the presser foot and lightly pull on the thread at the needle. See how easily it flows? Put the presser foot down and lightly tug on the thread. Does it move? It shouldn’t OR you should feel a significant difference between presser foot up and presser foot down. Try it – presser foot up vs presser foot down. Feel the difference? If you don’t…..I’m channeling Mrs. C right now……clip the thread at the spool. Lift the presser foot, pull thru the thread at the needle and thread again. If you do this 3 times and still have no tension on the thread when the presser foot is down we need to investigate why. I’m assuming that you haven’t mucked around with the tension dial (it should be at default whatever that is for your machine). Most likely the issue is that something is holding the top tension disks open – like a foot in the door – or the tension disks are worn out. You either need to try cleaning the machine as explained later OR bring it in for service. By the way – turning the tension dial is usually NEVER the solution to a problem. I adjust my top tension constantly because I change thread weights or embroider on specialty fabric like silk chiffon or use unusual threads like 100wt silk or metallic or 12wt cotton. So I adjust my top tension to accommodate a change in my embroidery project – not to solve a problem with regular thread on regular fabric. I know…., its a dial and something that we have the power to adjust. When something goes wrong the first thing we look for is the “magic button” to fix it – remember my “been there done that” voice? 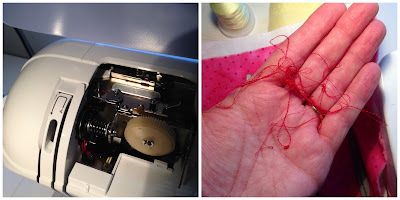 If you have to adjust the tension with the dial and it made a difference and you’re not embroidering with something unusual like I described — you may want to look at cleaning out the machine because tension doesn’t usually go bad. You could be collecting crud in the tension area so YES, adjusting tension solves the problem …. for now. If threading isn’t the issue, the other cause can be that the thread is not being fed into the machine evenly and smoothly. Watch the thread come off the spool as your machine is stitching. Is it springy or loopy looking? Does it slowly unwind then kind of “jump” when it gets to the top of the spool? That jump is a release of thread tension on the spool and will have a ripple effect along the thread into the machine. It can actually push again the computerized tension disks which sends a signal saying “hey! need to loosen tension”. So the tension disks open wide which allows excess thread to feed through, which has no place to go when it gets to the needle so it makes this big old loop under the hoop and then gets pulled which puts more tension on the top disks, and the cycle continues. Using a thread stand or thread nets can help solve that problem. There are many different stands available and some people just put threads in a coffee mug. I like to have the thread in a safe secure location feeding straight up to my machine so that it doesn’t get tangled or caught up in the hand wheel area and cause more problems. The picture on the left links to a reasonably priced simple stand like the one I have. Another cause for top tension problems is that you have threads or fibers caught up in the threading path. Remember my comment earlier about crud in the tension disks and adjusting the dial? This can happen if you get a thread break and you don’t get all of the pieces out. I’ve also seen it happen because someone did not unthread the machine with the presser foot up (they damage their tension disks) or was not in the habit of clipping at the spool and pulling thread along the same path. I was taught by Mrs C. to clip at the spool and pull the thread through. I have never done it any other way. And if you have damaged your tension disks, bring the machine in for service. So if you are having top thread tension issues, and have ruled out the obvious threading and thread spool issues, it’s probably time to check the machine. This blog post linked to below has some great pictures and commentary from her friend that has quite a bit experience with machine maintenance. Her photos are great along with her explanation on how to take apart the machine to find the cause of the problem. Clean your workspace and set out your tools so that they are handy. A clean workspace is having enough room to put the pieces you take off down in order with their screws and bolts. My entire table needs to be clear or else I will misplace that screw and end up bald and stressed. If you can’t start off with clear area, you don’t have time to start the project. Use your camera to take pictures along the way. Before you remove a piece, take a picture so you know what it looked like where its supposed to be. When the piece comes off, take a picture. If you had to push on a certain area to get the part off, take a picture. You have a phone on your camera. Take photos along the way and you can delete them at the end. tweezers, bright lights, flash light, should also be handy. I also have my machine oil nearby, if it moves and is metal I lubricate it. Less is more. Get out your manual and have it handy. Most service manuals are available online. Just like your regular manual it is a great reference. Don’t FORCE anything. Hammers are never involved. Prying with screwdrivers is not a good thing. Some plastic cases will snap into place and therefor have to be coaxed apart. If you’re not a patient person, you really need to think twice about tackling this type of project. I don’t care if you’re on deadline with a million things to finish. If your flustered and upset and have never done this before – either get into a calm methodical mindset or bring the machine in to someone that has the experience and let them do what they know how to do. If you just posted to Facebook that you are ready to throw the machine out the window and are near tears – you’re not in a good mindset to take on this project. Let an expert fix the problem and put it on your calendar to take the time to take apart your machine when you’re not under deadline. Make the time. Yes, when its not broken. You can take it apart, get the experience, you will find fibers to clean out, and put it back together. If you ever want to be able to take apart your machine, you must make the time to do so when you are calm and open to new experiences and the joy of learning. Canned air should NOT be used unless you have removed ALL the plastic housing covers that will stop the air, and all it carries with it, from flowing through. So unless you are looking at a naked skeleton of a machine, keep the canned air in the cupboard. The blown crud will stop and collect when it hits a “wall”. That crud will attract more crud and fibers and dust from this point forward. It will grow and become “insulation” to keep the heat in – not good – or grow and take up space and get caught in some belt and make a mess. When you find the problem and clean everything out, reassemble in the reverse order. Everything needs to go back together the way it was. There are no extra parts. So, my original post was going to be a quick introduction and link to the other blog post and I sort of got carried away. Just remember that NO ONE was a machine embroidery expert on the first day or week or month that they started using their embroidery machine. Those that are successful have worked through every single problem you are having at some time in their embroidery experiences. They have developed processes that eliminate the problem from occurring in the first place – like me clipping my thread at top and pulling through. There is no magic button and there are a bunch of things that can cause a problem so there is never just one “go to solution”. Be patient with yourself and enjoy the learning process on this wonderful journey! All these experiences give you the knowledge so that you will be humming the “been there done that, I know how to fix it” melody. ← BX Fonts – Not sure what they are? Check out this information!